TORONTO (June 26, 2012)  Bill Hay, Chairman and CEO of the Hockey Hall of Fame, Jim Gregory and Pat Quinn, Co-Chairmen of the Hockey Hall of Fame's Selection Committee, announced today Pavel Bure, Adam Oates, Joe Sakic and Mats Sundin have been elected to the Hockey Hall of Fame in the Player Category. The vote took place today at the annual meeting of the Selection Committee in Toronto. Mats Sundin was born in Bromma, Sweden and was the first European born player to be drafted first overall in the NHL Entry Draft, in 1989 by the Quebec Nordiques. Mats spent 13 seasons with the Toronto Maple Leafs, becoming the franchise�s all-time leader in goals with 420 and assists with 567. 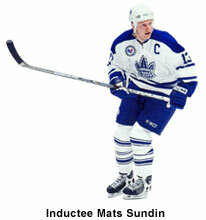 Sundin is the first Swedish-born player to reach 1,000 points in the NHL. He represented his home country internationally on 14 occasions, with the culmination being an Olympic gold medal in 2006. 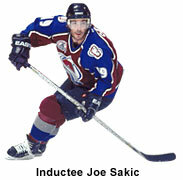 The 2012 Induction Celebration will be held on Monday, November 12th at the Hockey Hall of Fame in Toronto. TORONTO (June 8, 2012)  Chuck Kaiton, President of the NHL Broadcasters' Association, and Kevin Allen, President of the Professional Hockey Writers' Association, announced today that RICK JEANNERET, the play-by-play voice of the Buffalo Sabres for more than 40 years, will receive the Foster Hewitt Memorial Award for outstanding contributions as a hockey broadcaster, and ROY MacGREGOR, a renowned national hockey columnist and author, will receive the Elmer Ferguson Memorial Award for excellence in hockey journalism. 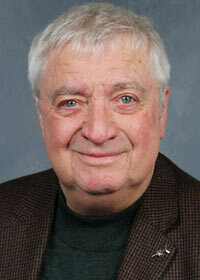 Rick Jeanneret has broadcast Buffalo Sabres' games on radio and television since 1971. Born in St. Catharines, Ontario and raised in Terrace Bay, Rick has also worked in various capacities at CJRN Radio in Niagara Falls, Ontario. He has broadcast hockey for the Niagara Falls Flyers of the then OHA prior and during his early years with Buffalo. Jeanneret's enthusiasm and many signature calls, such as '... and Buffalo wins it in oooooovertime! ', have made him extremely popular with Sabres' fans everywhere. "This is an honour that is long overdue; Rick has been synonymous with the Buffalo Sabres," said Kaiton. "His exciting calls have thrilled hockey fans in the greater Niagara region for more than 40 years." One of the greatest hockey storytellers in the history of the game, Roy MacGregor has found a way like few others to tie the sport that unites Canada through his work in newspapers and books. 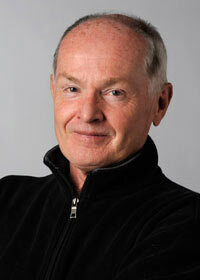 Over the past four decades MacGregor has received several awards for his hockey writing. In addition to crafting beautiful descriptions of the biggest Olympic and Stanley Cup final games, MacGregor has taken courageous stands against violence and supporting creativity in hockey. Currently a featured hockey columnist at the Globe and Mail, his career also had stops at the National Post, the Ottawa Citizen, the Toronto Star and Maclean's Magazine. MacGregor has authored several hockey books including Road Game, Home Game (with Ken Dryden), 7 A.M. Practice, The Last Season, The Home Team (nominated for a Governor-General's Award) and his most recent book, Wayne Gretzky's Ghost: And Other Tales from a Lifetime in Hockey. He's also written the massively popular children's series, the Screech Owl hockey novels. In short, he has touched hockey fans of all ages and all walks of life with his writing. "Roy is one of the great journalistic storytellers of this generation," said Allen. "He is a masterful wordsmith, an essayist, a columnist, and truly one of the most gifted craftsmen in our profession." MacGregor and Jeanneret will receive their awards at a luncheon presentation in Toronto on Monday, November 12th, and their award plaques will be displayed in the Esso Great Hall at the Hockey Hall of Fame alongside the 86 past award recipients.